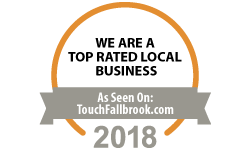 We are proud to have you as a reputable local supporter of the Fallbrook Chamber of Commerce. Showing others that you are a top-rated business in your community can be a great way to bring in new business and maximize your investment. To spread the word, we have provided a few different options to put a link back to your advertisement. You can put the link on your website, emails, Facebook pages, and any other place you see fit. Press CTRL+C to copy to your clipboard. Paste the copied code into your website’s html page wherever you would like it to appear. Right click on the button image above and save on your computer. Insert the image you just saved into the body of the email where you would like it to appear. Once the picture is inserted right click on it and select hyperlink or select the image and go to the “link” button on your toolbar. For the address, type: http://www.touchfallbrook.com and click ok.